Sir Terry Pratchett OBE (Terence David John Pratchett; 28 Apryle 1948 – 12 Mairch 2015) wis an English author. He wis kentfor his fantasy wirks, includin the famous Discworld series. 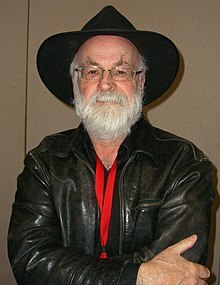 Pratchett deit at his home in Broad Chalke, Wiltshire, England on 12 Mairch 2015 frae a severe chest infection wi final complications frae his Alzheimer's disease, agit 66. ↑ Furness, Hannah (March 12, 2015). "Sir Terry Pratchett dies, aged 66". The Telegraph. Retrieved 12 March 2015.